You may recall a nice app we had mentioned, XSysInfo. 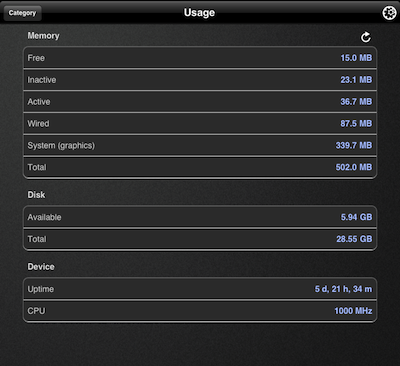 It’s a universal app that gives all kinds of info on our iPads about remaining usage on the battery and memory allocation. From time to time, when your running a lot of memory intense apps, loading and updating files a lot… you will start having apps launch then quit or hang on a screen. To reclaim memory we start with closing all the apps in the Multitask area (double tap the ‘Home’ hardware button, tap/hold on an app, then tap the ‘x’ on each to close the app – unlike tapping the ‘x’ in the Launcher that removes the app from the device). If that doesn’t work, then we restart the device. With XSysInfo, there was a little ‘refresh’ curly in the upper right of the information area that when tapped, released all the held memory. It was very quick to do to get going again, particularly important if your in a meeting or doing a presentation and your iPad starts freezing. 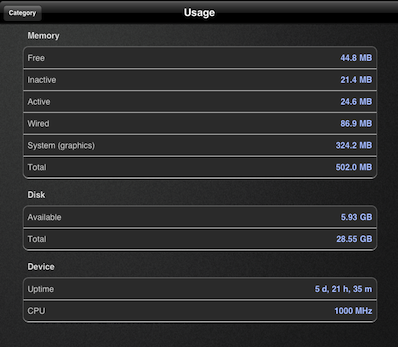 Notice how the Memory Free line increased from the above screenshot. In the most recent update to XSysInfo, the option has been removed. The developer mentions that Apple request the change (“Removed memory boosting features upon the request of Apple.“). Which, we can see why Apple might not want someone programmatic freeing memory, going around the system as designed, it’s sad news for us. This makes the app an information app, which there are many options for.